In Canada today, accessible bathing products are becoming more and more popular. In hospitals and care homes, there is a growing need for products to be versatile and innovative as well as purely functional. There are several concerns that we always hear from hospitals and care workers. How do I preserve the privacy of the patient? How do I prevent being soaked to the bone every time I go to work? Why am I always tripping on screens and curtains? We worry about these things too. That’s why we have sought out the best in accessible bathroom products for hospitals and care homes. We think that Romipex, has some of the most exciting innovations on the market today that will solve all of your working woes. 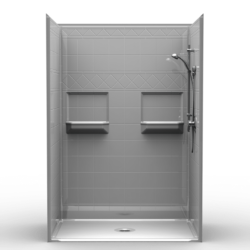 The Shower Splash Protection System consists of waist height folding and swiveling curtains for accessible showering. Not only does it offer increased privacy, but it also eliminated the need for wet clothing to be changed frequently. Romipex Telescopic Arms, solve the tripping nightmare with a range of curtain screening systems that can be fixed directly to the wall. There is no need for any additional supports on the floor, and the screens can be folded away with a simple push. Also in the Telescopic range, are Rompiex cubicles. 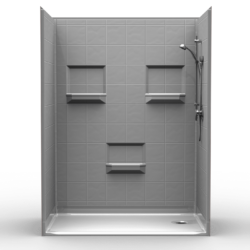 Also easy to install and pack away, they offer fantastic versatility and privacy. Use them for changing rooms, washing or even for patients that require inhalation or radiation treatment. Attention to small details like this can make a huge difference to the experience and comfort of your patience and the overall safety and quality of your work environment. Ropimex flame-retardant curtains also come in a huge range of attractive materials and colours.